Michael Irwin, Woodwind Technician, announces the expansion of the woodwind repair staff to keep up with increased work load. Our primary focus was on pro horns...lots of Mark VI saxes, Buffet Clarinets, Powell and Haynes Flutes. But we never lost sight of how important it is to support the local school music programs. The Los Angeles Unified School District maintains one of the only in-house musical instrument repair facilities in the country. But even with a full time staff to handle everything from pianos to piccolos, they sometimes need a little help! The Woodwind Shop in Altadena has been selected as a preferred vendor to assist with the repair of woodwind instruments. Michael Irwin, owner and head woodwind technician at the Woodwind Shop, started in the band instrument business while working for Whitey's Band Instruments in San Francisco. He says, "Our primary business was servicing school music programs, and over the Summer Break we'd have literally hundreds of instruments in the shop! I'm well aware of how important it is to get the job done before school starts in the Fall." After leaving Whitney's, Michael owned and was head woodwind technician at Marin Woodwinds, in Marin County, California. "Our primary focus was on pro horns...lots of Mark VI saxes, Buffet Clarinets, Powell and Haynes Flutes. But we never lost sight of how important it is to support the local school music programs." After moving to Southern California Michael started the Woodwind Shop in Altadena, focusing on high-end instruments. But he always keeps the door open to students. "Some shops that specialize in pro horns don't like working on student instruments. Personally, I think it's extremely important for student instruments to play well, and I do my best to treat them with the same care as a top-of-the-line instruments. If an instrument is out of adjustment and difficult to play, it could be the reason a budding musician gives up." When the Los Angeles Unified School District called to ask if Michael was interested in working on dozens of horns, he knew there was no way he could keep that pace and also maintain a high level of quality. So he's hired two assistants to ensure the work gets done quickly, and at the highest standard of quality. 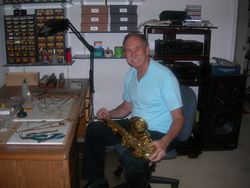 Visit Michael at http://www.woodwindshop.com for interesting articles and information about woodwind repairs. The Woodwind Shop in Altadena can be reached at 626-794-9571.